What is structural adhesive 3M™ Scotch-Weld™ DP 8010 Blue and what does it bonds? 3M™ Scotch-Weld™ DP 8010 Blue is structural, acrylic adhesive for permanent bonding of LSE plastics (Low Surface Energy). It can also bond plastics with HSE (High Surface Energy). DP 8010 Blue provides not only aesthetic look, but also strong bonding between the LSE plastics, metals, glass, and even wood. There is a minimum preparation of the surface needed prior application. In order to use it, you will need 3M EPX Manual Dispenser for two-component adhesives. It can be used for different applications – from medical equipment to small engine tools. In such cases the usage of specialized “adhesive” is preferable to welding. With the structural adhesives you can make changes during the bonding process – it bonds fast and does not require expensive equipment or any specific training. 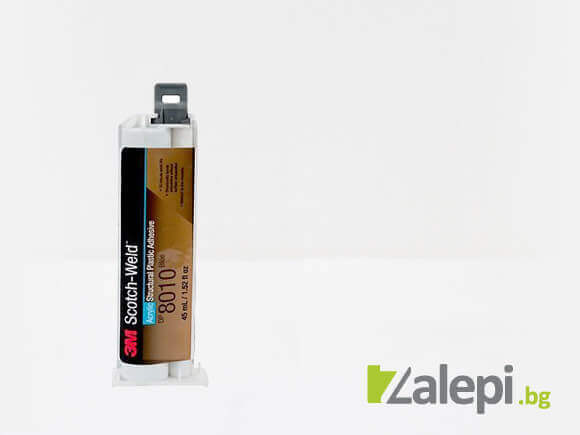 3M ™ Scotch-Weld ™ DP8010 Blue can bond all types of plastics. For the use of structural adhesive DP 8010 you will need: 3M EPX Manual Dispenser, EPX Plunger III DP 8010, mixer EPX DP 8010. – 8 minutes working time. – 10 minutes for fixating the materials. Pay attention, that the working time of the adhesive is 8 minutes. In case you haven’t used the entire adhesive in that time, you will need another EPX DP 8010 mixer.